Leave the transportation logistics for your special wedding day up to Champion Charter Bus Phoenix. With a wedding shuttle bus, the bride, groom, and wedding coordinator won’t have to worry about guests getting lost. Keep your mind on the important day ahead while Champion Charter Bus handles the guest transportation. Call us at 480-257-7734 to get a free, personalized quote for your wedding shuttle buses. No matter the location of your wedding, we’ll be sure to get your guests to the venue as smoothly as possible. 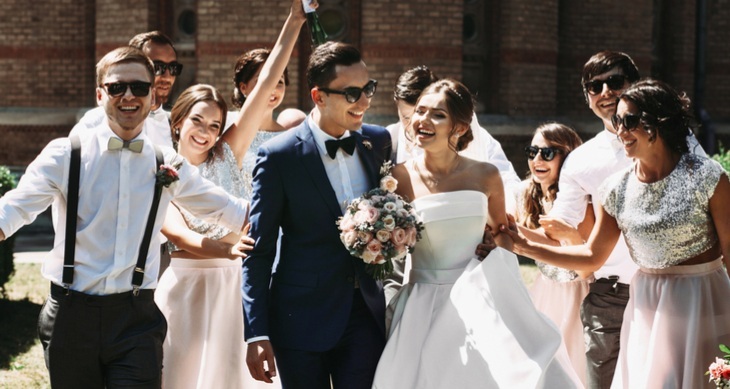 Whether your wedding is taking place downtown at the Kimpton Hotel Palomar or out in Scottsdale at Taliesin West, Champion Charter Bus is here to offer high-quality transport services. A wedding shuttle will help simplify guests arriving to and leaving from your wedding, especially if the venue is in a busy area around downtown. Everyone will be picked up at a designated location before being shuttled over to your beautiful service. Your guests will easily and comfortably make it to your venue with plenty of time to spare before the ceremony. A charter bus can easily suit wedding groups of all sizes. Instead of coordinating parking for hundreds of vehicles, rent a fleet of buses with professional drivers to shuttle your guests. If your guest list is large and you’re having a lavish ceremony, a full-sized motorcoach or fleet of motorcoaches is best for you. Each of these buses can comfortably accommodate 56 passengers on the way to your wedding ceremony. Small to medium-sized ceremonies would be best suited with minibuses, which come in a variety of models. Choose from 18-passenger, 20-passenger, or 25-passenger models for your intimate wedding day. Once the ceremony is done, your shuttles can even take everyone to the reception area if it will be off-site! Our network of charter buses and minibuses include modern and sleek models to fit with even the most elegant wedding theme. Depending on availability, you can request an all-white or all-black bus to go with the decor of your ceremony. The shuttles can also include additional amenities like WiFi, power outlets, auxiliary ports, and a PA system so your guests can get the party started on their way to the reception. If you’re ready to book your wedding transportation, give us a call at 480-257-7734! Our rental experts are here to assist you 24/7 in finding the best wedding shuttle bus for your big day. We’ll get you a free, personalized quote for your Phoenix wedding day.